07 Ottobre 2017 | in English. We are here as autonomous militants, because we want to experience this political experiment of radical transformation of society, we want to understand the method and the attitude towards permanent education of both militants and the whole society.” A large delegation of comrades from the InfoAut collective hailing from various Italian cities has arrived since a few days in Rojava and in Maxmur: “we are here in order to shorten the distance between an ongoing revolution and the one we commit ourselves to build in our own country”. In the ISIS’ Syrian capital the Syrian Democratic Forces (SDF) are victoriously struggling for freeing the city, thus marking a decisive step in the six-years war. Meanwhile also in Deir Ez-Zor ISIS is losing its last bastion, and the confederal revolution also came to direct confrontation with the Syrian state, ruled by Bashar Al-Assad’s dictatorial regime. On September 22 the first free elections to elect presidents and co-presidents of people power bodies were held in the Northern Syrian Federation. 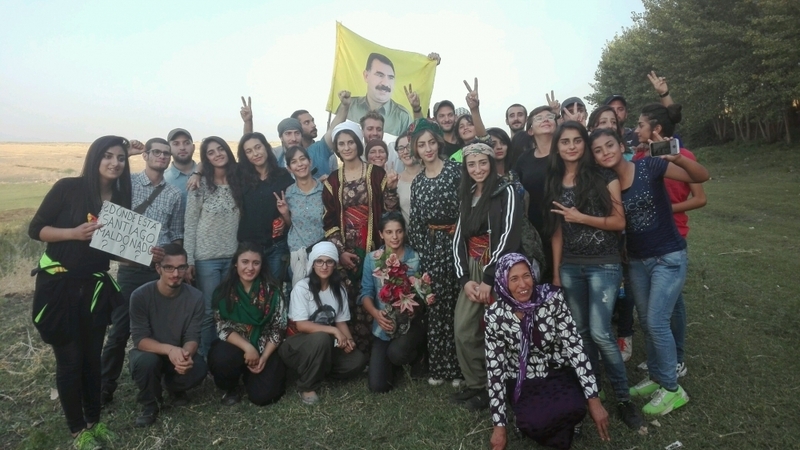 In the same days a delegation of the Infoaut collective, composed by comrades of many Italian cities, is in Rojava and in Maxmur: the first one, in Northern Syria, is the only victorious front of the Syrian revolution; the second one, in Iraq, is the forgotten revolutionary experience, the first laboratory of democratic social organization. They will ask us why to embark in such a journey in order to reach a country that seems so far and so different from our own. Many people from our country came this far in order to bring solidarity or to fight. We are only at the beginning. We will try to explain the reasons that have driven us here, without knowing yet how our ideas could change during this experience. In this country there is a revolution that is changing society and that represents the only force able to effectively fight against ISIS. Those who are fighting ISIS in the frontlines are neither Salvini [chief of the Italian xenophobic party Lega nord], Minniti [Italian Minter of interior] and Le Pen, nor Trump or Renzi, but thousands of young Kurdish, Arab, Assyrian, Turkmen and International women and men that daily put their lives at stake also for us. Probably no one would understand what we are talking about if Daesh (ISIS) would not had carried out the attacks that stroke Europe in the last years or if the city of Kobane would had not heroically resisted to the 2014 siege. Before then, public attention for whatever happens in this part of the Middle East was basically non-existent, in spite of the fact that in these same countries there was the highest numbers of attacks and victims by ISIS. Faraway countries, histories that do not touch us. We do not agree, we think that it is not possible to remain either passive or indifferent. Among us, who did not have a friend at the Bataclan, on the streets of Paris, on the Ramblas or through the alleys of Berlin or Nice? In those places and in those youths we recognize our kindred, and the ISIS an enemy. In our countries the collective acknowledgement of Daesh’s existence and of his dangerousness translated into a securitarian paranoia, state of emergency, electoral profiteering by xenophobic parties against the Muslims and the immigrants. This is the backlash that strenghtens ISIS, whose goal is to draw a line of hate between Muslims and the rest of the world. Because - it is worth to remember it - it is not simply an attempt of a state institution being territorially extended through Iraq and Syria, but of a political proposal for millions of Muslims. Both to those living in permanently unstable countries and on the brink of destructive wars, also because of Western interests; and to those living in a xenophobic Europe. ISIS cannot be destroyed without destroying the system it is part of. But that is not conceivable without a deep change of mentality, social relationships and of the whole life. Actually, at the moment, the only effective solution against ISIS is that of confederate revolution, that explored with the banishment of the Assad regime in 2012 and that was the outcome of a political work which developed through almost forty years, and started with the foundation of the Kurdistan Workers’ Party (PKK) in 1978. The Maxmur communes, that still exist, were the fundamental junction of this history, and created from 1995 a Communist mass experience in the Iraqi desert south of Mosul. This social force was both able to fight ISIS on a military level, and to offer an alternative political proposal, one valid for the whole Middle East and, potentially, for the whole humanity: democratic confederalism. The PYD and the YPG/YPJ transformed the tragedy of the Syrian war in the chance to give strength and incisiveness to the proposal of democratic confederalism. In Northern Syria, the war against Daesh is not detached from a radical social and political change. On the basis of the transformation of the social and economical relationships, and of the women, the youth and the people power’s institution, the proposal of a life wanting to overcome state and the artificial borders dictated by the colonial powers, that envisages coexistence of many peoples in mutual friendship. Supporting and knowing the revolution. How many experienced witnessing a revolution? To witness a situation of radical transformation of a society, the constitution of communes and other forms of people power? We deem it to be a definite duty of any revolutionary to support and know the revolutions of her historical age. It is important to break the isolation in which the confederate revolution is kept, to defy the Turkish embargo, that is complicit of ISIS, and that of the Massoud Barzani - the Iraqi Kurdistan president - regime. And above all we want to give out contribution in order to break the political isolation and the silence of the information media on this revolution. That is more the necessary in the moment when all the states in the region, Turkey above all (which is respected and treated as an economic partner by both Italy and Europe), try every mean in order to hindrance the revolution, also with military actions and bombardments in Syria, as in Iraq and Bakur. Our thought goes in particular to those men and women that came here from Italy and other countries in order to fight for the revolution. We are here as autonomous militants, because we want to experience this political experiment of radical transformation of society, we want to understand the method and the attitude towards permanent education of both militants and the whole society. Has this revolution also something to teach us? Surely. In which terms? How decisive are the differences of the Italian society and our way of thinking? We do not know this yet. We do not pursue the exotic appeal of a revolution lacking practicable alternatives in our countries. On the contrary we are here in order to shorten the distance between an ongoing revolution and the one we commit ourselves to build in our own country. To see the only anticapitalist revolution of our century it is neither fetishism nor a badge. The radical transformation of an entire society is an extremely complex and long process, where contradictions intertwine and moments of acceleration alternate with moments of difficulty and resistance. At its foundation there is a political praxis that uses the possibilities which are opened by the contradictions of the context in which she works, that envisages the construction of different organizations in order to achieve different goals, that establishes alliances that allow a consolidation of the revolution, without losing sight of its own final goal. To live this reality enables one to perceive the concreteness of the word hevalti - the political friendship. A very important concept for this revolution and a very powerful one, that we want to delve into on the field, too. It is a matter of the relationships to be found amongst whose cover a part of a process, contributing together to the revolution in the most various forms. Hevalti it is the continuous personal involvement with the complexity of social relations, of the ambivalences and ambiguities of the society, and not only with who is the same of us. But it does not mean to accept what appears in front of us as it is. Actually particular care is dedicated to perwerde, continuous education and transformation of the way to look at the world. As much as fundamental is the women revolution based on jineoloji. The overturn of the social and political role of the women is as real as difficult. Starting from different assumptions from Western feminisms, the revolution is able to implement concrete change, giving a new breath to the perspective of struggle of women, in Middle East and beyond. From this experience we want to bring back as many teachings as possible in order to treasure them, to raise the theoretical and practical tools we own to revolutionize our society and our life, too. Because to do the revolution means also to transform oneself, one’s own way to think and to live. We are obliged to this revolution and to all the people who gave life in order for a better society to be possible. From our mountains to Northern Syria, always partisans! Hundreds of people answered, in Italy too, to the call arriving from the Kurdish enclave under attack by Erdogan.